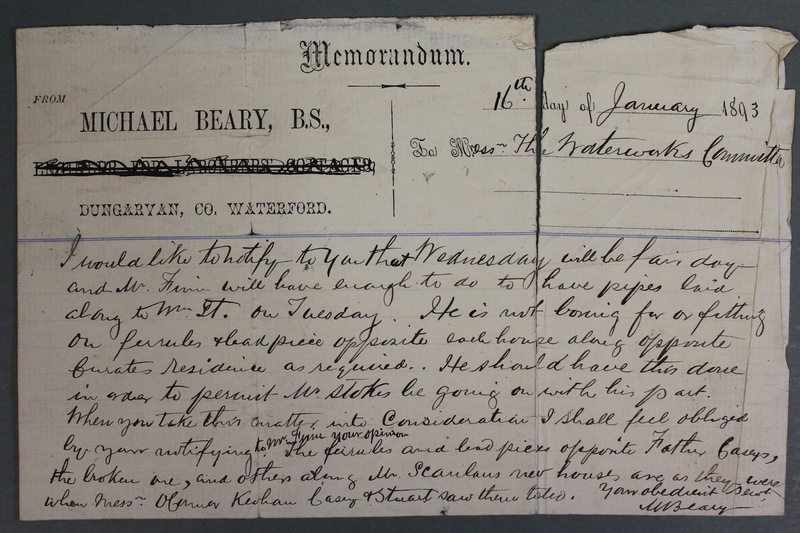 Michael Beary (1841-1917) lived in Sexton Street, Abbeyside. He was appointed Borough Surveyor in 1882 a post he held until his retirement in 1908. Edmund Keohan states that he designed two schemes of Artizan Dwellings in Dungarvan. This billhead notes that he was 'Engineer for Labourer's Cottages'. He was interested in local history and was a member of the RSAI. He was also an amateur artist and painted a number of illuminated addresses including that to Captain Veale on display in the museum. 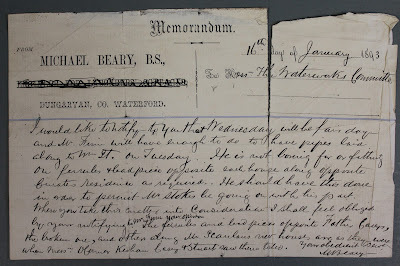 To hear more about Beary and public housing in Dungarvan William Fraher will be giving a talk on the subject at the Group for the Study of Irish Historic Settlement's conference at Lawlor's Hotel on Sunday the 13th of May.